Hedley the Skull, my steampunk conference badges, and I all rolled into Portland last Monday for the OSCON event. Imagine my surprise to find daytime temperatures in the 90s. I felt like I was back home in the Orlando oven. That’s OK, it cooled off during the week and Friday morning was in the mid-50s. Quirky Portland, I like it a lot. Wednesday morning brought the keynotes and I especially liked the live coding demo by Suz Hinton. She assembled a little Arduino-servo breadboard project, live on stage. She also wrote out the 13-line program, while we watched. The whole working demo was completed and running in about nine minutes, to massive cheers from several thousand techie experts. Hinton did a phenomenal job under considerable pressure. The feat certainly set the tone for rest of the conference. I also met Jerome Hardaway, in the speaker’s lounge. He started a charitable non-profit, called Vets Who Code to help U.S. veterans learn how to program. As a proud vet himself, his mission is to help them transition back into civilian life and find gainful employment after military service. He even had a full-sized Captain America shield attached to his backpack. It was a great promo spin for his cause. Look him up and consider supporting his program, if you can. Thursday was a busy day, with my “Linux Steampunk Conference Badge” talk in the morning and the “Meet Hedley” show in the late afternoon. Doing two talks in one day is tricky and requires quite a bit of logistic-gymnastics. Although somewhat nerve-wracking with DIY gadget demos, the show must go on and the modern tech didn’t let me or the audiences down. Without a doubt, the Raspberry Pi, the Arduino Pro Mini and the JeVois machine vision sensor are all very robust off-the-shelf pieces of gear. Make sure you have strong power bricks and the stuff just works. We had good audience participation in both sessions and everybody seemed to like the content and my nerdy jokes. Of course, having a robotic skull on stage just begs for puns and a light-hearted approach. Hedley’s transport case worked like a charm. 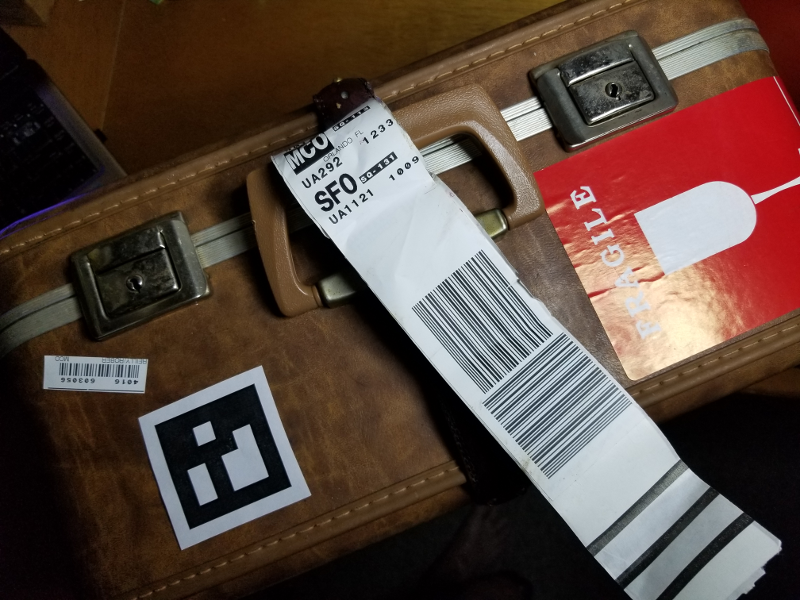 At 5:45 a.m. Monday the United Airlines guy slapped the “MCO to PDX” sticker on the handle, a big red “Fragile” sticker on the top and off Hedley went on his first airline baggage adventure. One of many, we hope. Hedley is looking for new gigs and sponsorship deals, BTW. I used some fiber-fill batting to make a couple of cushions that fit inside the case. Squishy foam might have given a more finished look, but the material turned out to be pretty pricey. A 36-inch x 18-inch x 2-inch thick piece cost over $15. I did buy a yard of cool Paisley print cloth, from the fabric store and used it to cover the batting. Being not much of a seamstress, the fabric seams were secured with hot glue. It worked well and was fast, although uncomfortable on the fingers. Hedley rode safely between the two cushions, which packed down fairly tightly when the lid was closed. There was plenty of room around the edges of the cushions for the power bricks, the HDMI cable and extension cord I needed for the show. I’m not sure what was originally in the case, but the wireless keyboard/mouse-pad fit nicely in the lid, using a set of built-in stretchy straps. The total weight for the Hedley, his case and the internal gear was about 15 pounds. Bottom line is that Hedley and the badges made it out and back without damage. Off-the-shelf hackers should always provide durable packaging to protect their gadgets during transit. A one-off case is also a great place for a promo graphic or to act as a conversation starter. I purchased a small 10-watt LED work-light to use during low-light conditions with Hedley’s vision system. Lowes sold me their last floor model, without a box for $5. Mine ran on 110 volts AC or 12 volts DC from a car outlet. A two-amp wall-wart worked great too. Bright-white LEDs are pretty glare-y, so you might want to put a little translucent material over the front if you need to look toward one of these devices for any length of time. A piece of white 1/8 inch thick flexible foam toned the harshness down quite a bit. I decided to forgo hauling the light to the talk after re-conning the session room on Wednesday. At the time, the room lighting seemed adequate. Sadly, using the saliency example demo during Hedley’s talk proved problematic. Babies look at things that are salient like bright lights, movement, or a smiling face. Anything that gets their attention is considered salient. During the talk, Hedley was facing the audience with quite a bit of back-lighting behind me. My back was to the audience. Consequently, my face wasn’t lit up enough for him to track me reliably. One audience member offered me a flashlight and the next thing I knew he and two others with cell-phone lights were blinding me with their help. Talk about audience participation! The situation was pretty funny and drew a lot of laughs, which was very cool. Thanks, guys. The lighting trick didn’t improve Hedley’s response much so I was a little disappointed with that part of the demo. Everybody in the room certainly understood the complexity of machine vision and still seemed to appreciate the exercise. When I returned home I sent the guy who developed and sells the JeVois sensor a note about my Portland talk. He suggested that I try using Aruco markers instead of saliency for on-stage tracking. Try the 640×480 resolution model, he said. I promptly found an on-line Aruco marker generator and printed out a few symbols. Sure enough, they worked a whole lot better than trying to get Hedley’s attention while jumping around or flashing shiny objects in front of him. The JeVois sensor has built-in algorithms to detect a variety of Aruco markers. 4X4 (50 symbols) is the standard marker dictionary used by the JeVois device. Print some of those first to get started. You can then change the “dictionary” parameter over the serial command line (to the JeVois) or in the config file if you want to use other dictionaries, up to the 7X7 version (1,000 symbols). You can also use Aruco symbols in “3D” mode, which will give 3D locations and orientation of the markers, relative to the JeVois sensor. Naturally, some calibration is needed for reliable and accurate operation, in this mode. Check the docs for details. The Aruco markers also eliminate another problem I had using saliency for tracking. Background clutter, bright lights, object movement and multiple shiny objects strongly affect the real-world focus of the sensor. In other words, Hedley has a very short attention span, with saliency. Using a single Aruco marker will pretty much force Hedley to pay attention, while I walk around on stage. Not only that, using a smallish 2×2-inch sized marker, I could get reliable tracking in fairly dim light out to about six feet. Over the next few days, I’ll test t-shirt-sized markers at various light intensities and distances. You better believe I’m thinking about marketing angles for this capability. One last thing, Terry, my room tech for the badge talk was great. Aaron, in the Hedley talk, did a nice job as well. Both knew exactly what needed to be done to set up my room and were real pros. As a speaker, always respect your room tech’s expertise and they will do everything humanly possible to make your show look and sound good. Overall, Hedley and I had a nice trip to Portland. OSCON is one of the best conferences I attend. The people, facilities and program are all top-notch. Disclosure: as a speaker, the O’Reilly organization paid part of my travel and lodging expenses. Portland is quirky, hip and a beautiful city. You should plan a trip soon even if your robotic skull can’t join you.